Even the greatest men are prone to a little exaggeration. All the more so before science had its insistent foot in the door; when the world was full of possibility. Take Benevnuto Cellini. Not a man but a superman: born in 1500, a goldsmith, a soldier, a musician, a painter and sculptor and a writer of a flamboyant biography which can get those pages turning even today. His biography is not just epic; racy, even; but what we might call these days, highly fanciful. Not only, he claimed, had he conjured up demons but on occasions he had a halo of light surrounding his head, he tells us. 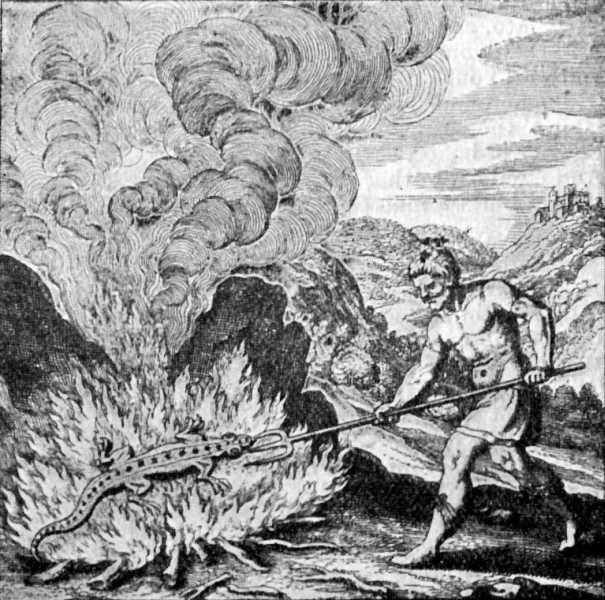 And to top it all, Cellini claims to have seen a salamander: not just a modern lizard salamander, but one of the old school ones, the fire-forged variety. And it happened when he was about five years old. His father was in the basement. That was where the household washing was done: stout oak was used to fuel the fires and the logs were still burning.His father was playing and singing, Cellini recounts, his eyes gazing into the fire all the while, when he saw in the middle of the flames a small lizard-like creature. he says the little thing, far from being consumed by the flames surrounding it, was actually playing in the core of the most intense part of the embers. And so he did what any good father does: he called his children to watch this marvel of wild life. For the purposes of this exercise I shall be dismissing this as amiable poppycock. Along with those theories brought forth by that Swiss Renaissance man, Paracelsus, which sounded so very credible at the time.There were four elemental beings made up matter, he proclaimed: gnomes had dominion over everything under the earth; undines, water spirits controlled water; sylphs took dominion of the air: and as to fire, it was left to the salamanders. These days salamanders have an altogether more prosaic brief. But they do still have superpowers. Yes: their limb regeneration is super-fast. It takes just a matter of weeks to grow a new tail, or foot. And finally, after all this time, scientists are watching the salamander carefully. For if nature can help a little salamander do this: might we not do the same for a human being? And the scientists have found the key to the little salamander’s success is flexibility. According to a study by researchers at the Max Planck Institute, when something is chopped off, a layer of skin cells covers the wound and then the salamander’s body moves cells to it to create a stump. But those cells are not specialised. They stop being specialised cells and instead become like a skeleton key: a blank able to specialise in any job it is assigned. From that stump, skin, bone, blood vessels, neurons – every necessary cell can be made to create an entire new functioning limb. And they do it not by shocking their bodies’ systems with cells which must start from scratch; but cells which are ‘partially reprogrammed’. Perhaps, say scientists at the Harvard Stem Cell Institute, this approach would be a good way to get our bodies to accept regenerating cells. Now that’s what I call legendary. Sometimes, one does not need to exaggerate at all. Posted in Quirks of HistoryTagged autobiography, benvenuto cellini, cell biology, Paracelsus, salamander, The science bitsBookmark the permalink. I would love to hope for the day when limbs can be regenerated in functional form. It would certainly be life altering for some, Andra! I wonder if the Salamander of today is merely a watered down version of the original, that regenerated so fast it would seem to survive even fire? Now there’s an idea, Sidey. So what Cellini saw was a Salamander in the embers, regenerating like the clappers…. Where there’s fire, there’s smoke? Couldn’t resist, Kate! I’ve watched videos claiming burn patients can grow new skin…but I was not convinced it was valid. We have salamanders that grow new limbs. A frog in Australia carry eggs in her stomach without digesting those eggs! When will we catch up? I certainly could do with some brain cell regeneration, on a daily basis. There is an attractive idea, Roger! Cell research has identified a universal cell that can be focused to help in the generation of numerous body parts. Once this moves from the political forum to the medically practical arena, we will be able to emulate the salamander. The future is now. Amazing stuff, Lou. It’s a brave new world. So, then. Death will lose it’s sting? Regeneration could mean the end of death for all. Why stop at limbs? Could this be the stuff of which nightmares are made? I love your posts. Always plenty to think about. Thanks Myfanwy! I have read sci-fi which combines cloning and the ability to move a mind from one body to another. Creepy. But compelling. Ah, but that would be a wonderful thing, wouldn’t it, Kate, for many? It would transform lives, Penny, I am sure! Salamanders are not the only critters that have the capacity to shed and regenerate their tails; so do geckos, and until this morning I just figured they were in the same family. Not so! I found that whereas the salamander is an amphibian, the gecko is a reptile (if I ever learned that as a student, apparently it was NOT something my thinking cap found worthy of retention). In any event, that means there’s more than one species capable of this regeneration process; so why not ALL? Personally, I believe God gave mankind far more capabilities than most of us have utilized thus far. Indeed, Karen! And if we pool our abilities we could gain so much, it seems! Somewhere in all that is the tipping point between the rock and the hard place. It feels alien, this whole regeneration business, doesn’t it, Cameron? More like sci-fi than somethign happening now. And I suppose while we are in experimental stages we have no idea what the long term effects of actions like these might be. Only time will tell. It’s that old chestnut: we can: but should we? Ah, those genial amphibians…with a smile which would look at home on a civil servant….do they regenerate? Starfish can regenerate rays. Planaria can regenerate both head and tail on one organism. The lower and less specialized the animal, the easier it is for them to regenerate. Humans were severely limited in that area. Or that’s what I learned back in 1970. Fortunately, science didn’t stop in 1970. It’s amazing what potential there is in one little cell, if we keep studying. Insights into human physiology and mental function and yet to be discovered links exist in the plant and animal kingdom. Cellinni’s musings seem less far fetched than the Church doctrine of his time as well as that of our time. They so, Carl, you are so right! Perhaps I am too much of a fatalist thinking that limb loss causes other wondrous things to develop. Still, it would be good to like the salamander.